For this week's challenge you'll have already needed to complete part one. If you haven't done part one yet, why not?! In the second part we'll be introducing a line chart showing profit ratio over time. 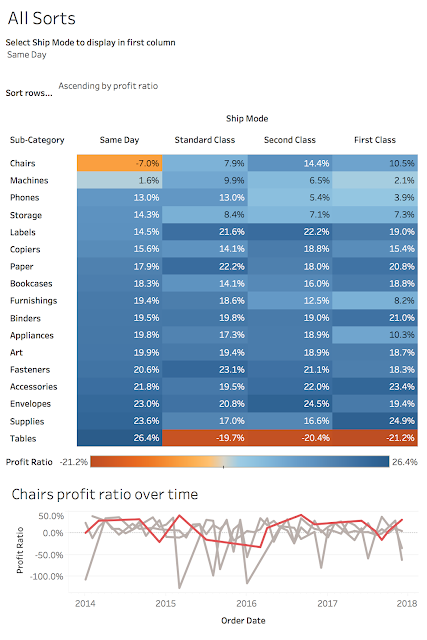 The catch being that the line chart should by default display the profit ratio for the product sub-category which is in the top row of the highlight table. If you select a different sub-category in the highlight table the line chart should change to show the selected sub-category instead. You'll need to use the same data set from part one. Big thanks again to Neil Lord for the inspiration for this challenge. Make sure you're following him on Twitter! Once you've completed the challenge make sure you tweet an image of your final work to @EmmaWhyte and @VizWizBI with #WorkoutWednesday. Good luck. Oh and if you're going to #data17 make sure to let me know on Twitter and come say hi to me! Hi Tony! You can download mine and Andy's workbooks from Tableau Public, see how we did it and then compare to yours. I couldn't figure out how to make the line chart choose by default the sub-category in the top row. Do y'all post solutions somewhere :)? Hi! You can download our workbooks from Tableau Public and reverse engineer them for the answers.